G8LED Grow Lights provide the largest yields when growing indoor with LED technology. G8LED grow lights grow healthier plants and produce robust flowers with increased resin formation, more flavor, aroma, and potency. Award-winning G8LED grow lights have the most efficient spectra and a very dense network of diodes which work together to bring balanced light energy to the plants. Plants thrive and output large yields, with little electrical consumption and no excess heat. The G8LED diode formulation maximizes growth and yield, without wasting energy in unnecessary wavelengths. While some lights promote more wavelengths, G8LED lights only use the portions of the light spectra which the plants require, in the correct proportions to grow healthier plants. If more wavelengths were better for indoor growing, a 15-band, 20-band or an all-band white light would be able to outperform, but more is not better when it comes to the science of indoor growing. Which LED Grow Lights Work the Best? What LED grow light should I buy? 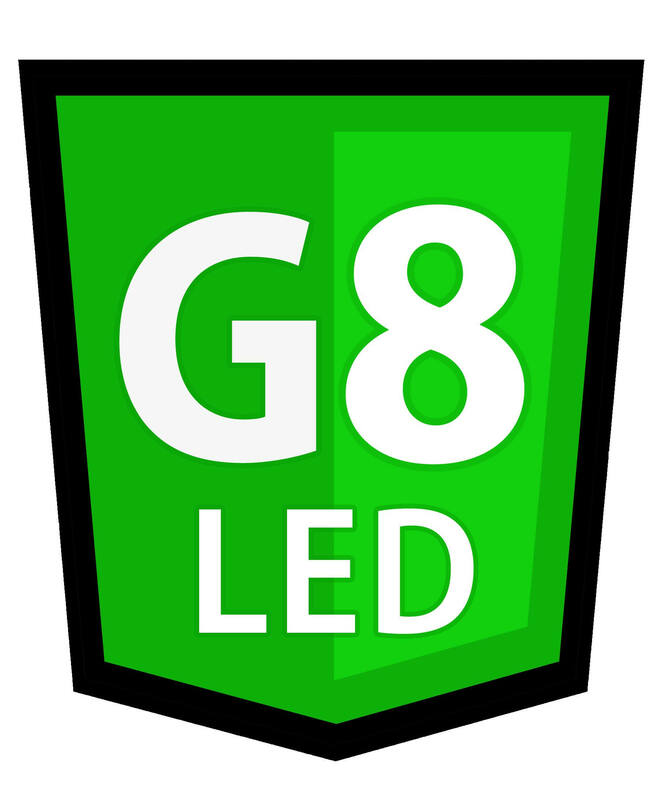 Although there are many good choices, G8LEDs are some of the top performing lights for indoor growing. G8LED lights produce more PAR, more yield per watt, and more yield per square foot than other grow lights. G8LED lights have a very high concentration of light energy per square inch which means more plant growth. With G8LED lights, not only is the dry weight yield maximized, but the plants produce a higher quality product. A G8LED will outperform a similar wattage white or yellow light because it is targeting the exact portions of the light spectrum required by the plants. G8LED lights use diodes from 380 to 760nm, with some white diodes to round out the color range. The UV diodes in the G8LED lights allow plants to form more trichomes which make for frostier plants. Using an all white light defeats the whole purpose of using LED technology to target specific wavelengths of light required for plant growth. NASA used targeted spectrum lights when testing LED lights for growing food in space! G8LED grow lights have gone through several iterations of improvements over the years, to bring about very high quality and highly efficient grow lights. Designed by electrical engineers turned indoor growers, G8LED lights have been an excellent addition to many grow facilities. G8LED lights also come with exceptional customer service to our customers. If you would like to upgrade your grow room or commercial facility, please contact us and we will do our best to help you! Grow Green with G8LED Grow Light Technology!